All in all, If you’re looking for an animated story that both boys and girls will enjoy then definitely get How to Train Your Dragon 2 on iTunes. In today's world of animated movies, How to Train Your Dragon 2 is an anomaly. There are no princesses or catchy tunes to sign along to and the plot actually makes some sense. And while there is still an element of fantasy, it doesn't overwhelm the story. When we return to Berk for this latest installment, there is peace and harmony. The Vikings and dragons live together and take care of each other. There is fun and frivolity in the land as evidenced by the "dragon races" and The Vikings soar through the skies on the backs of their winged friends. Hiccup (Jay Baruchel; The Sorcerer's Apprentice) is up to his usual tricks of hiding from his father, inventing new contraptions and discovering and exploring new lands. While out on their adventures, hiccup and toothless find a dragon wrangler, Eret (Kit Haringtron; Game of Thrones) and his crew with their holding cells destroyed by what seems to be a huge iceberg. The wrangler thinks Hiccup is the culprit and tries to capture toothless to bring back to Drago (Djimon Hounsou; Blood Diamond, Guardians of the Galaxy) a ruthless monster who is creating a dragon army. While escaping from Eret and searching for Drago, Hiccup stumbles across the vigilante saving the dragons from Drago. What he finds is someone completely unexpected. Including a star studded cast, How to Train Your Dragon 2 is well acted. Gerard Butler (Olympus has fallen, The Ugly Truth) returns as Stoick, Hiccup's father and the Chief of Berk who is hoping to pass down the title to his daydreaming son. Craig Ferguson (Brave, The Late, Late Show with Craig Ferguson) is also back as Gobber, the town black smith, Stoick's best friend and the comic relief for much of the movie. America Ferrara (Ugly Betty, The Good Wife) is Astrid, Hiccup's love interest. Joining then is Cate Blanchett (Lord of the Rings) as Valka, the unexpected hero of the dragons who also happens to be Hiccup's long thought to be dead mother. The story isn't groundbreaking by any means but it is a refreshing change from all those princess and sappy songs. The epic battle scene between Drago and "the good guys" almost reminded me of a cartoon version of something out of Lord of the Rings, with larger than life mythical creatures battling to the death. The two deaths; one creature, one human; were especially hard and reminded me once again that I wasn't watching a "Happy Disney Tale". The iTunes 1080p digital copy is simply amazing the colors on the print were sharp and vibrant which was especially beautiful when Hiccup finds his mother at the dragon hiding ground. The 5.1 audio is what you would expect and shook the walls when the dragons roared. The only thing missing is possibly a lossless audio track (hopefully Apple will add that someday). The iTunes digital copy extras included a 26 minute film short explaining how the dragon races found their origins. It was very cute and had some of the funnier moments on the whole disc. There is also an hour long segment about the making of Dragon 2 which was interesting. We see everything from the announcement of Dragon 2, to writer/director Dean DeBlois' (Lilo and Stitch) creative process to the producers' trip to Norway and how those stunning visuals made it into the film. Aside from this they went along and included the entire film again with audio commentary. Something that is very rare on digital copies of films. All in all, If you're looking for an animated story that both boys and girls will enjoy then definitely get How to Train Your Dragon 2 on iTunes and keep it in your virtual library because Dream Works has already announced How to Train Your Dragon 3 will be released in 2017 (Don't forget to start counting down with the Movie Hype App) ! Download How To Train Your Dragon 2 from the iTunes Store in Digial HD. 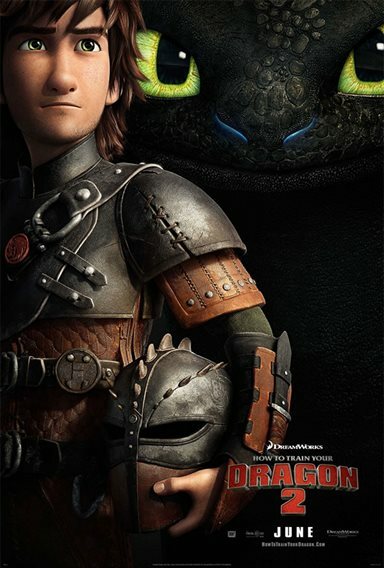 For more information about How To Train Your Dragon 2 visit the FlickDirect Movie Database.